(3) because there are things people can do to reduce the impact acute stress disorder can have on people. 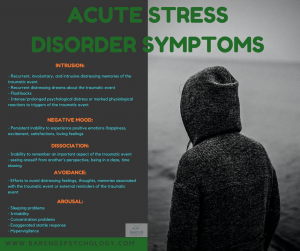 Understanding acute stress disorder also helps relatives and friends understand how ASD affects someone. Someone with ASD may experience concentration problems, irritability, difficulties remembering certain aspects of the traumatic event, and mood swings. Also, ASD is associated with physical health problems, particularly chronic pain . By understanding what it means to have ASD, relatives and friends can offer their support to the person with ASD. A good support network and family cohesion reduce psychological distress and thus the ASD symptoms ,. How to cope with ASD? 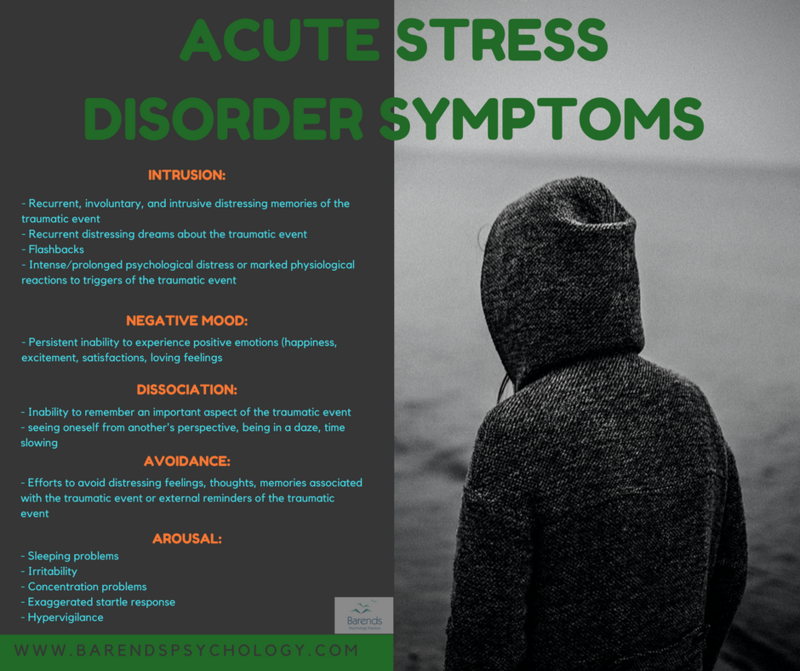 At Barends Psychology Practice, acute stress disorder treatment is being offered (also online). Go to contact us to schedule a first, free of charge, first session. (Depending on your health insurance, treatment may be reimbursed). people working in fields where exposure to the consequences of a traumatic events are more likely: disaster workers, police men, fire fighters, et cetera. for more risk factors, please go to: ASD facts. Arousal: feeling irritable, experiencing sleeping problems, concentration problems. For the official diagnostic ASD criteria, click here. Jenewein, J., Wittmann, L., Moergeli, H., Creutzig, J., & Schnyder, U. (2009). Mutual influence of posttraumatic stress disorder symptoms and chronic pain among injured accident survivors: a longitudinal study. Journal of traumatic stress, 22, 540-548.